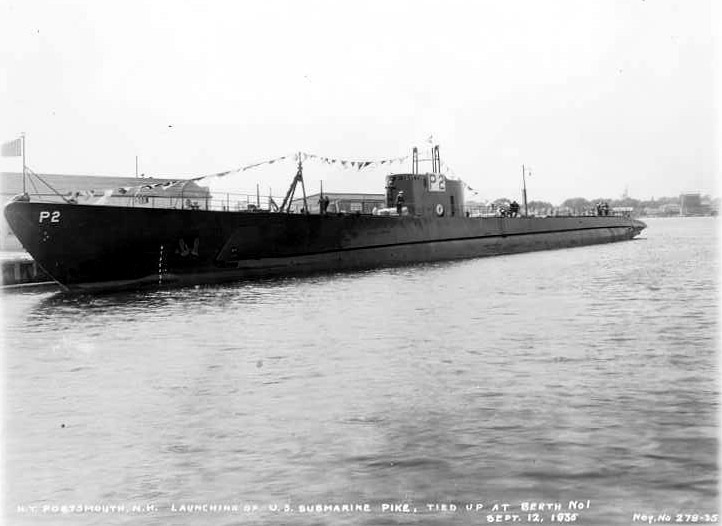 Porpoise Class Submarine: Laid down, 20 December 1933, at Portsmouth Navy Yard, Portsmouth, NH; Launched, 12 September 1935; Commissioned USS Pike (SS-173), 2 December 1935; Decommissioned, 15 November 1945, Boston; Laid up in the Atlantic Reserve Fleet; Placed in service as a Naval Reserve Training Ship at Baltimore, MD., in September 1946; Placed out of service and simultaneously struck from the Naval Register, 17 February 1956; Final Disposition, sold for scrapping, 14 January 1957, to A. G. Schoonmaker Co., New York, NY. 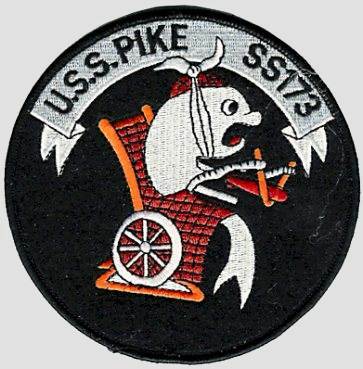 Pike earned four battle stars for World War II service. 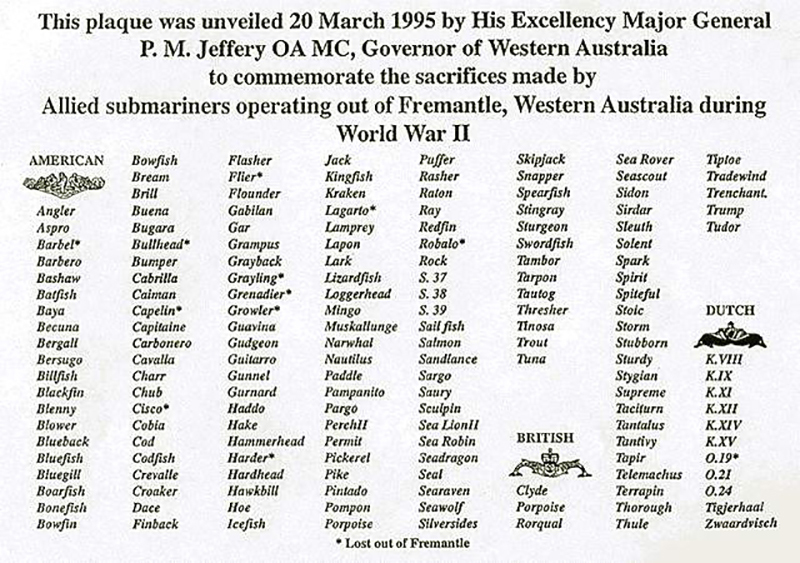 Specifications: Displacement, Surfaced: 1,310 t., Submerged: 1,934 t.; Length 301' ; Beam 24' 11"; Draft 13' 1"; Speed, Surfaced 19 kts, Submerged 8 kts; Maximum Operating Depth 250'; Complement 5 Officers, 45 Enlisted; Armament, six 21" torpedo tubes, four forward, two aft, 18 torpedoes, one 3"/50 deck gun, two .50 cal. machine guns, two .30 cal. 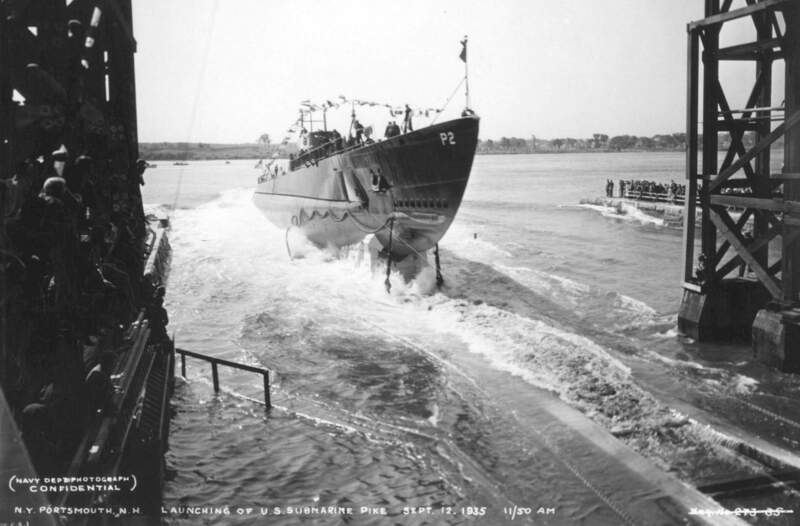 machine guns; Propulsion, diesel-electric drive, Winton Engine Co., diesel engines, 4300hp, Fuel Capacity, 93,129 gal., Elliot Motor Company electric motors, 2,085 hp, Battery Cells, 240, twin propellers. 16k Pike Esox lucius. Courtesy of freshwater-fishing-guide.com. 262k Keel laying of the Pike (SS-173) on 20 December 1933, at Portsmouth Navy Yard, Portsmouth, NH. US Navy photo courtesy of Tommy Trampp. NR Bolstering the Nation's first line of defense with Public Works money. 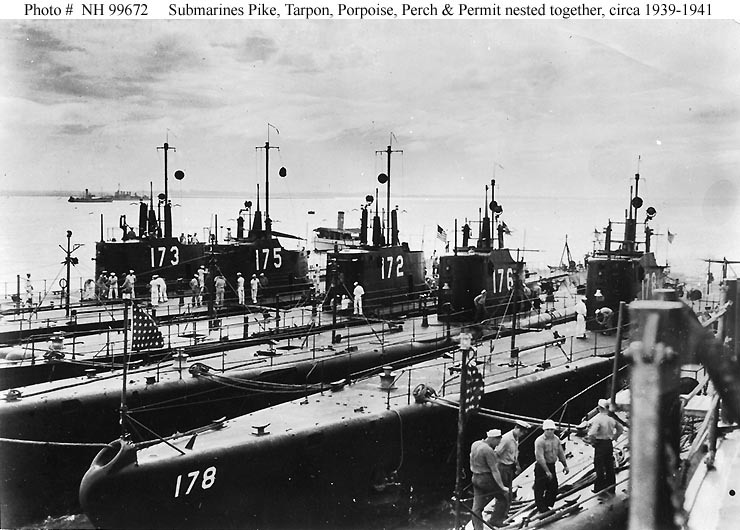 The picture shows construction work on the submarines Porpoise (SS-172) and Pike (SS-173) at the Portsmouth Navy Yard. Image and text provided by Library of Congress, Washington, DC. Photo & text by Evening Star. [volume] (Washington, D.C.) 1854-1972, 07 January 1934, Image 78, courtesy of chroniclingamerica.loc.gov. 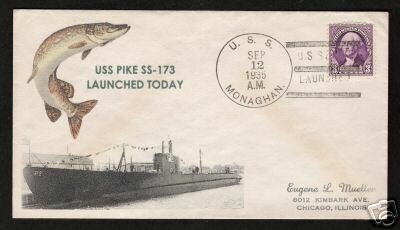 234k The Pike (SS-173) is launched at 11:50 on 12 September 1935. USN photo courtesy of Scott Koen & ussnewyork.com. 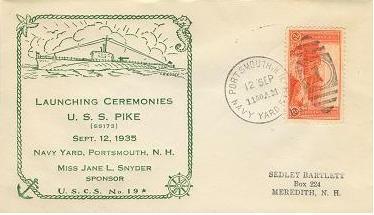 19k Commemorative postal cover marking the launching ceremony of the Pike (SS-173), 12 September 1935. Courtesy of Jack Treutle (of blessed memory). 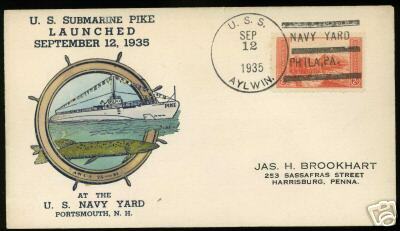 18k Commemorative postal cover & photo inset marking the launching ceremony of the Pike (SS-173), 12 September 1935. Courtesy of Jack Treutle (of blessed memory). 104k The Pike (SS-173) at berth # 1, after she had been launched at Portsmouth Navy Yard, Portsmouth, NH., 12 September 1935. 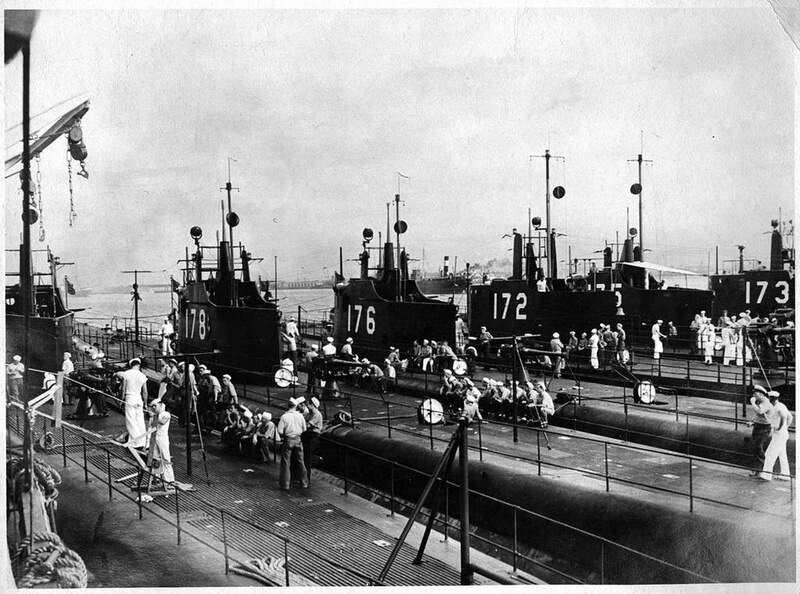 USN photo courtesy of ussubvetsofworldwarii.org. 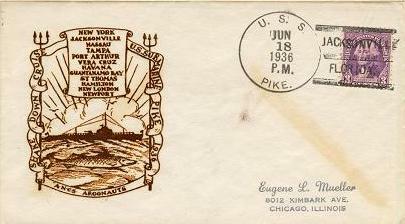 18k Commemorative postal cover marking the commissioning ceremony of the Pike (SS-173), 2 December 1935. Courtesy of Jack Treutle (of blessed memory). 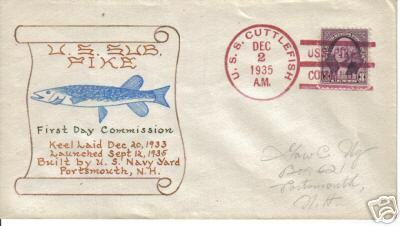 18k Commemorative postal cover marking the first day in commissioning of the Pike (SS-173), 2 December 1935. Courtesy of Jack Treutle (of blessed memory). 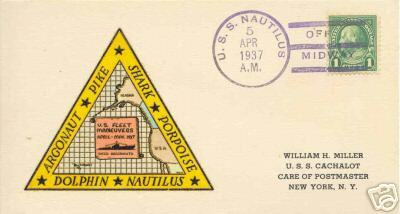 21k Commemorative postal cover marking Pike's (SS-173) shakedown cruise and ports of call, 18 June 1936. Courtesy of Jack Treutle (of blessed memory). 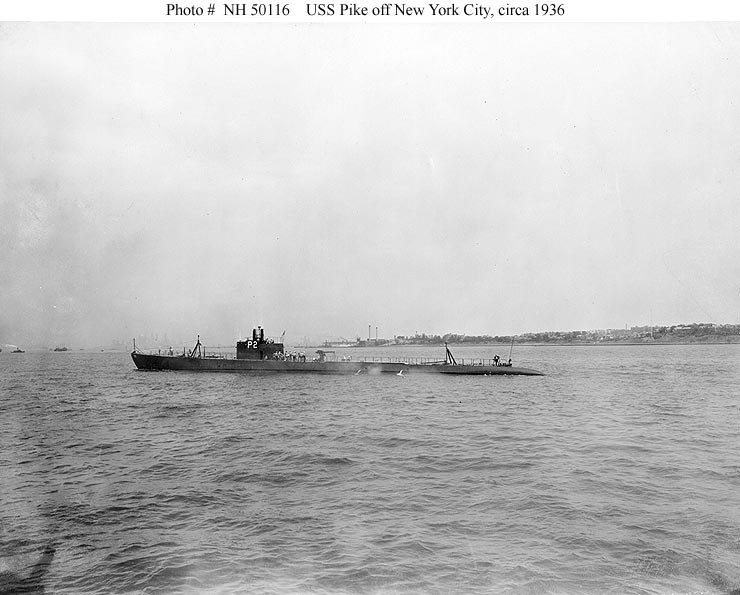 69k Pike (SS-173), in New York Harbor, circa 1936. The Manhattan skyline is faintly visible in the distance, beyond Pike's bow. NH # 50116, courtesy of U.S. Naval Historical Center. 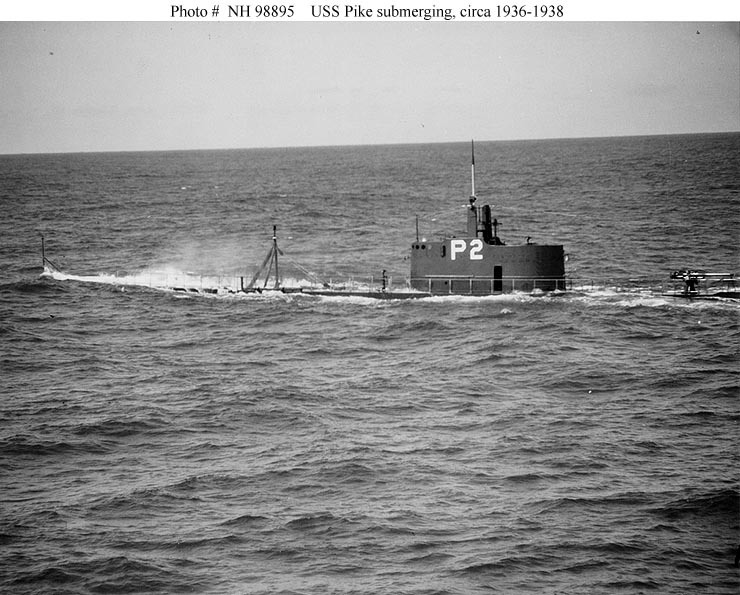 104k Pike (SS-173), submerging, circa 1936-1938. Photograph distributed by the U.S. Navy Recruiting Bureau, Room 726, Washington & Christopher Sts., New York. NH # 98895, courtesy of the Naval Historical Foundation, collection of Commander E.S. 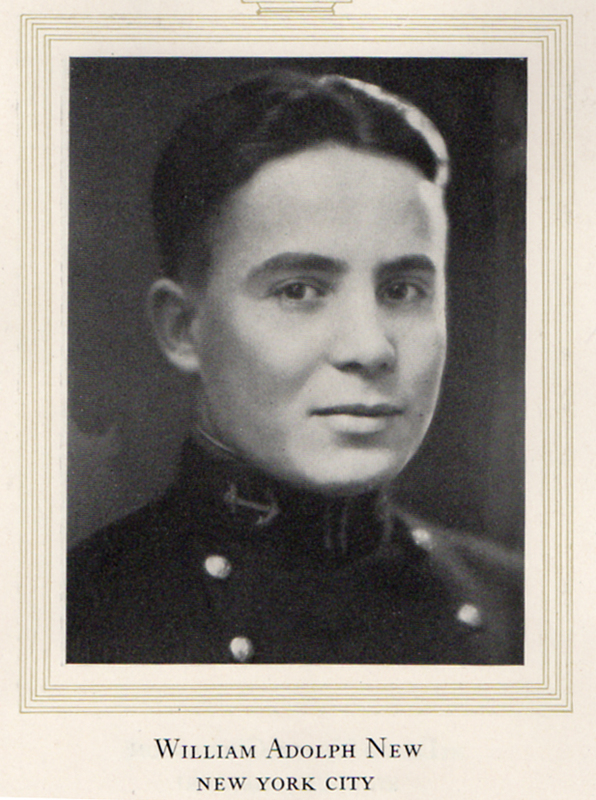 Moale, USN (Retired). 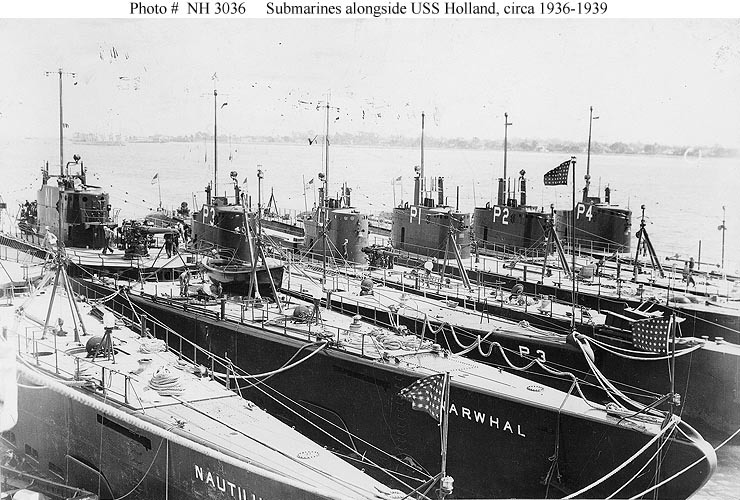 OfficialUSN photo from the collections of the Naval Historical Center. 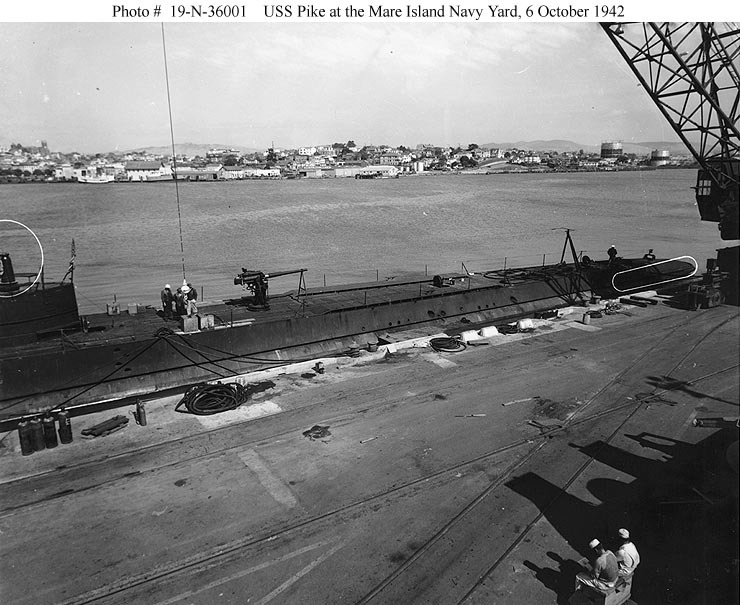 134k The Pike (SS-173) off the Mare Island Navy Yard, California, 6 October 1942. USN photo # MI-6157-42 courtesy of Scott Koen & ussnewyork.com. 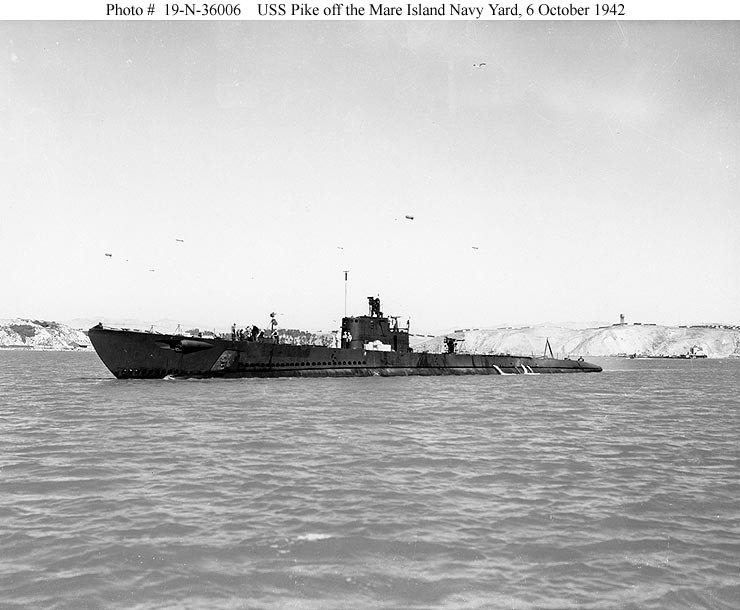 68k Pike (SS-173) off the Mare Island Navy Yard, California, 6 October 1942. 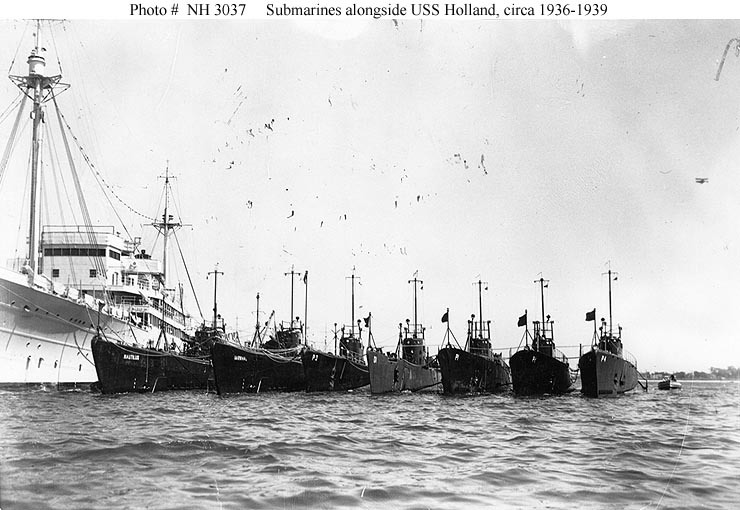 Photograph NH # 19-N-36006, from the Bureau of Ships Collection in the U.S. National Archives. 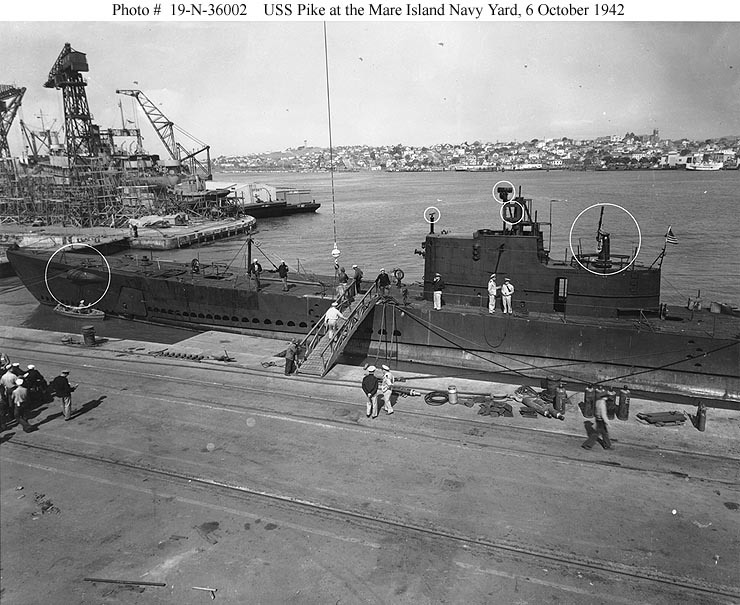 113k Pike (SS-173), at the Mare Island Navy Yard, California, 6 October 1942. The city of Vallejo is visible in the distance, and barges YF-267 and YF-387 are in the left center. White outlines mark recent alterations to this submarine, among them external bow torpedo tubes. 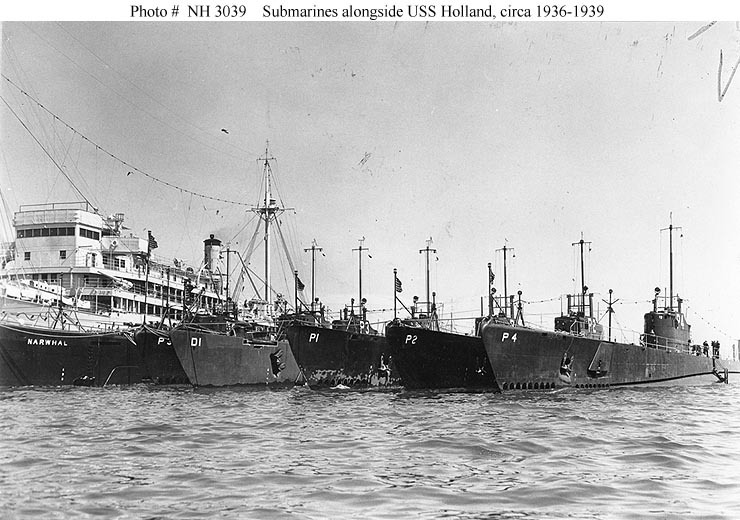 Photograph NH # 19-N-36002, from the Bureau of Ships Collection in the U.S. National Archives. 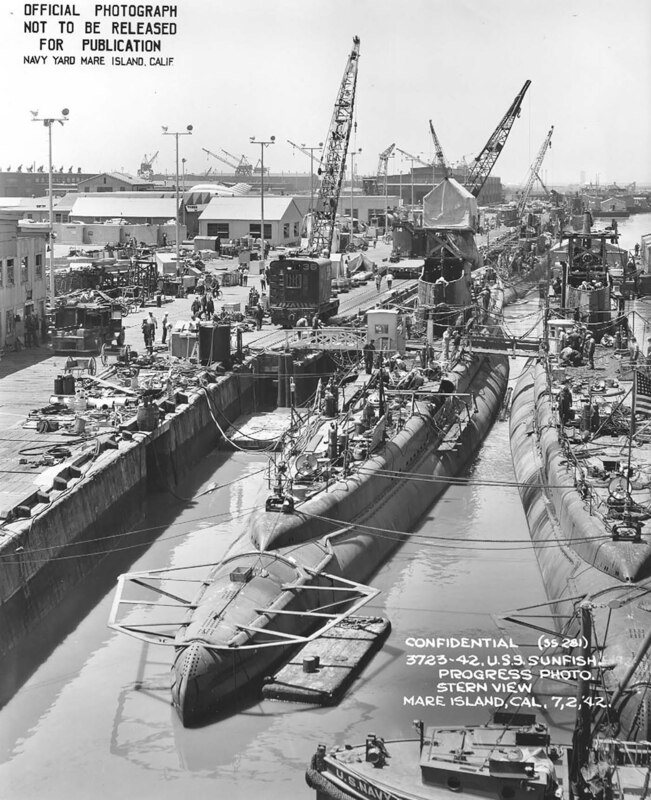 103k Pike (SS-173), at the Mare Island Navy Yard, California, 6 October 1942. The city of Vallejo is visible in the background. White outlines mark recent alterations to this submarine. 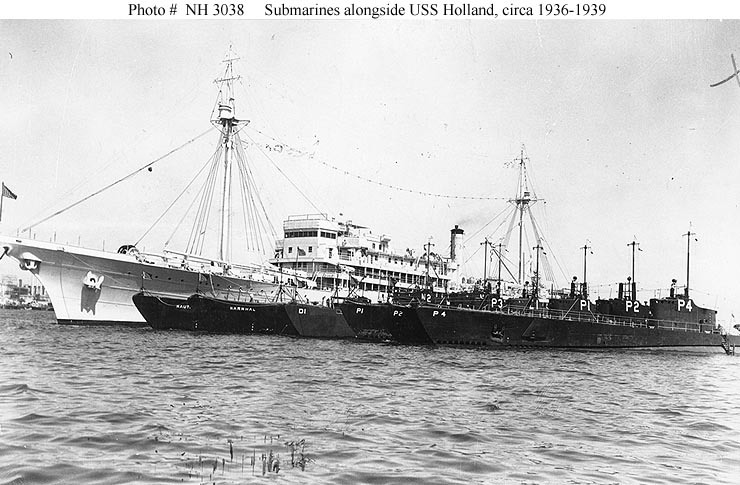 Photograph NH # 19-N-36001, from the Bureau of Ships Collection in the U.S. National Archives. 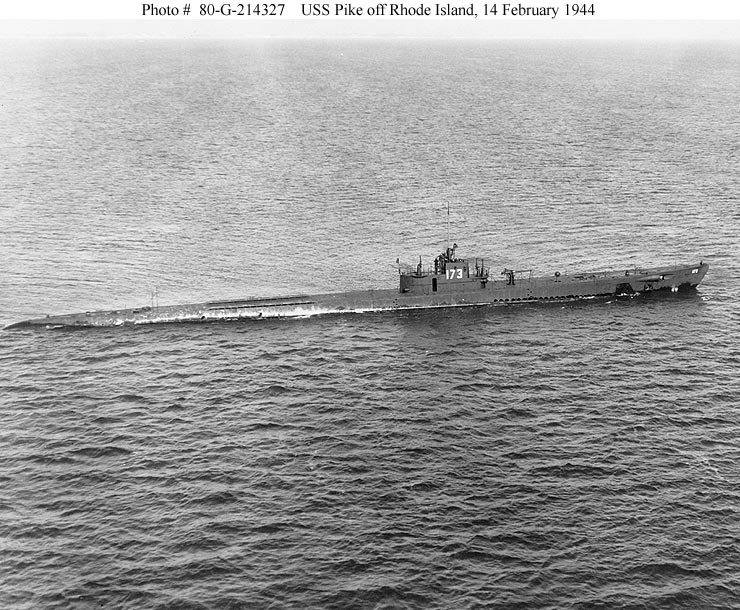 103k Pike (SS-173), operating off the coast of Rhode Island, 14 February 1944. OfficialUSN photo NH # 80-G-214327, now in the collections of the National Archives. 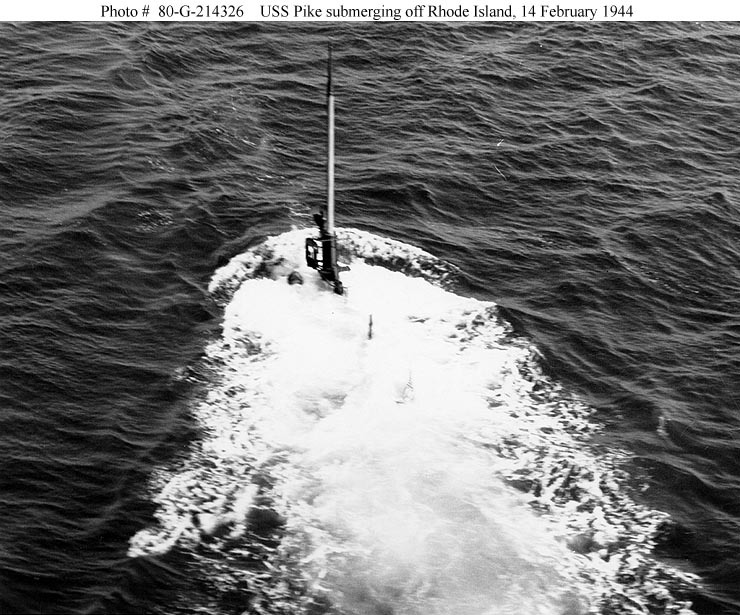 124k Pike (SS-173), submerging off the Rhode Island coast, with only her periscope visible, 14 February 1944. OfficialUSN photo NH # 80-G-233816, now in the collections of the National Archives. 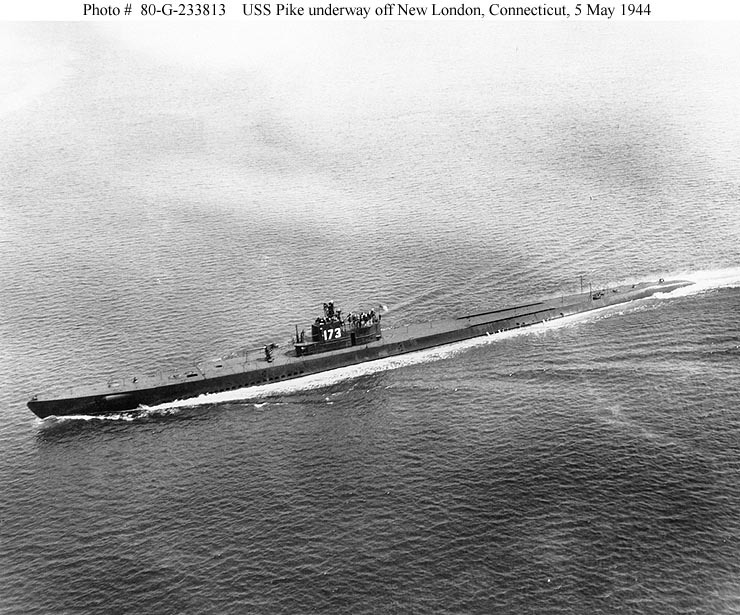 121k Pike (SS-173), underway off New London, Connecticut, while serving as a training submarine, 5 May 1944. OfficialUSN photo NH # 80-G-233813, now in the collections of the National Archives. 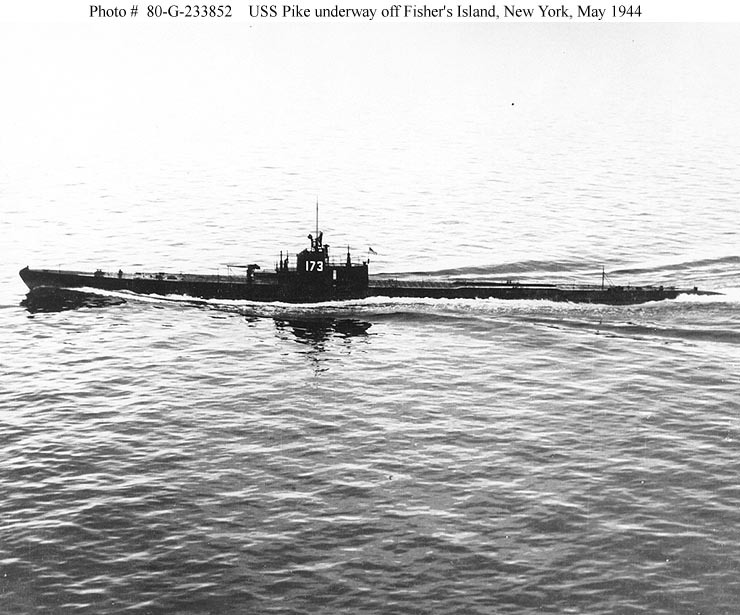 1.30k Pike (SS-173), underway off Fisher's Island, New York, in May 1944. US National Archives photo # 80-G-233852, from NARA, College Park, Maryland, courtesy of Sean Hert. 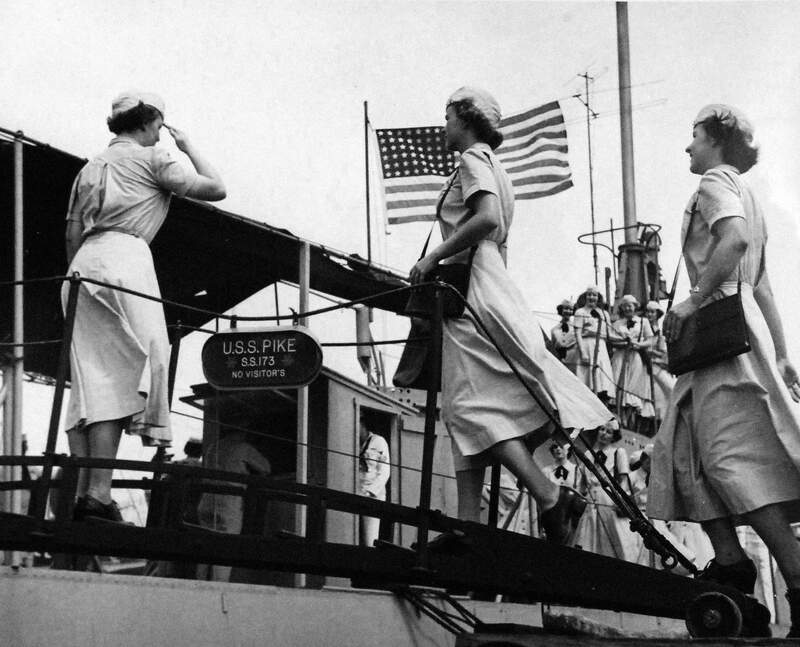 1.89k Reserve Officer Candidates cross the quarterdeck of Pike (SS-173), 1 September 1953, as they visit naval installations. 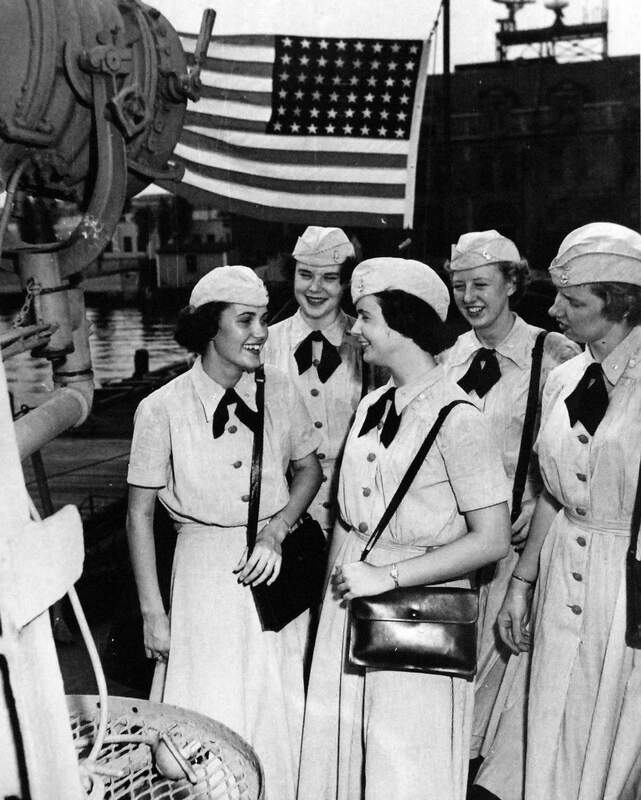 A group of ladies pose here beneath the search light. Photo # 330-PS-6057-2 & 330-PS-6057-3 (insert) courtesy of the National Museum of the U.S. Navy, via flickr.com.